Plants have long been investigated as a source of antibiotics and other bioactives for the treatment of human disease. New Zealand contains a diverse and unique flora, however, few of its endemic plants have been used to treat tuberculosis. One plant, Laurelia novae-zelandiae, was reportedly used by indigenous Maori for the treatment of tubercular lesions. Laurelia novae-zelandiae and 44 other native plants were tested for direct anti-bacterial activity. Plants were extracted with different solvents and extracts screened for inhibition of the surrogate species, Mycobacterium smegmatis. Active plant samples were then tested for bacteriostatic activity towards M. tuberculosis and other clinically-important species. Extracts of six native plants were active against M. smegmatis. Many of these were also inhibitory towards M. tuberculosis including Laurelia novae-zelandiae (Pukatea). M. excelsa (Pohutukawa) was the only plant extract tested that was active against Staphylococcus aureus. Our data provide support for the traditional use of Pukatea in treating tuberculosis. In addition, our analyses indicate that other native plant species possess antibiotic activity. Tuberculosis (TB) is the leading cause of death due to a single infectious organism . In 2007, 1.78 million people died from the disease and an estimated 9.27 million new cases were recorded worldwide . TB requires a lengthy treatment period of six months with the first-line drugs rifampicin, isoniazid, ethambutol and pyrazinamide . The availability of new drugs that shortened the course of chemotherapy would improve patient adherence and affordability thus, enabling more favourable treatment outcomes. In addition, alternative drugs are needed to counteract the spread of drug resistant TB which threatens global control programmes . MDR-TB, resistant to rifampicin and isoniazid, now exceeds 0.5 million cases per year  and in some states accounts for up to 22% of TB cases [2, 5]. Extensively-drug resistant (XDR) strains of M. tuberculosis, resistant to both first- and second-line drugs, were first reported in the United State, Latvia and South Korea in 2006  but are now present in 57 countries . The World Health Organisation has advised that new TB drugs are required to treat TB [8, 9]. While much of the focus has been on screening libraries of synthetic compounds for mycobacterial inhibitors, plants have often provided a source of anti-bacterial compounds. For example, Aegicerin, isolated from Clavija procera, has been shown to have activity against Mycobacterium tuberculosis H37Rv and MDR-TB strains . Rhodomyrtone, a compound from the Southeast Asian plant Rhodomyrtus tomentosa was found to have potent antibacterial activity against a number of clinically-important Gram-positive species including Enterococcus faecalis, Streptococcus pneumoniae and methicillin-resistant Staphylococcus aureus (MRSA) . In this work, solvent extracts were prepared from 45 native New Zealand plants and screened for activity using Mycobacterium smegmatis. Active samples were then tested against Mycobacterium bovis BCG, M. tuberculosis H37Ra, Escherichia coli and Staphylococcus aureus. A number of plants were identified as containing anti-Mycobacterium tuberculosis activity and their potential for generating novel compounds for the treatment of tuberculosis is discussed. The mycobacterial strains used were Mycobacterium smegmatis mc 2155, M. bovis BCG (Pasteur) and M. tuberculosis H37Ra. M. smegmatis and M. bovis BCG were labelled with GFP through the introduction of the plasmid pSHIGH+hsp60 by electroporation and selection on media containing 50 μg/ml kanamycin as previously described . GFP-labelled Staphylococcus aureus Newman was constructed as follows: the fdh (formate dehydrogenase) promoter was amplified from S. aureus Newman using Phusion™ Flash High-Fidelity PCR Master Mix (Finnzymes, Finland) according to the manufacturers' instructions with primers GGGGACAACTTTGTATAGAAAAGTTGgaaggggtaagtgtgataagc and GGGGACTGCTTTTTTGTACAAACTTgtctttaaaataagaagttcattaattgttc, where uppercase represents attB sites for Gateway cloning (Invitrogen) and lower case represents S. aureus DNA. The 275 bp amplified product was cloned into pDONR221 using BP Clonase™ II (Invitrogen) and used to transform chemically-competent Escherichia coli TOP 10 (Invitrogen). The insert was sequenced to confirm an error-free amplification. Gateway cloning with LR Clonase™ II (Invitrogen) combined the fdh promoter with gfp, or gfpluxABCDE, and the rrnBT1T2 terminator in the destination vector pDEST-pUNK1 as described previously . The correct plasmid constructs from bioluminescent/fluorescent LR-reaction transformants of E. coli TOP 10 were confirmed by restriction mapping. The plasmids generated were electroporated into S. aureus RN4220 as previously described  and then transferred to S. aureus Newman by bacteriophage transduction . S. aureus strains containing pDEST-pUNK1 derivatives were selected on media containing 30 g/ml erythromycin. Escherichia coli DH5α was labelled with GFP using pOT11 . 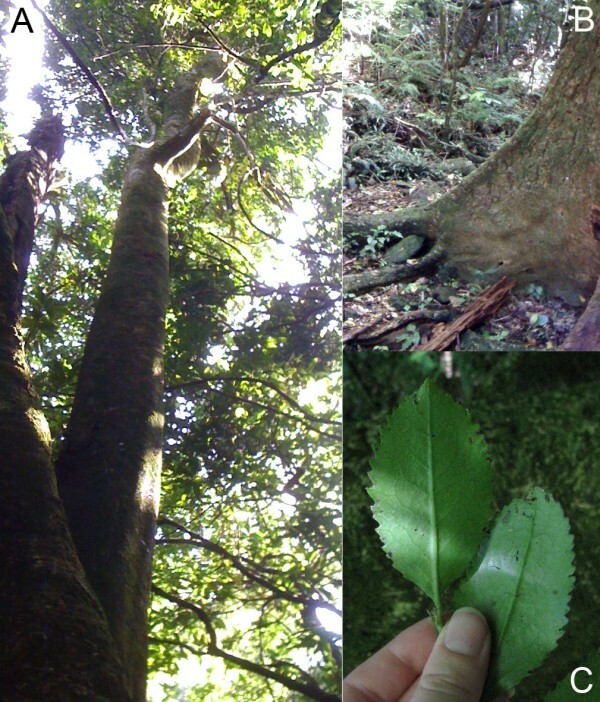 Plant samples were collected from the Karori Wildlife Sanctuary (Zealandia) and the Otari-Wilton Bush Reserve, Wellington; Kaitoke Regional Park, Upper Hutt; and the Nelson region with permission. The native New Zealand plants tested for anti-mycobacterial activity are listed in Table 1. Plant samples were collected fresh, macerated and dried in a desiccator. For each sample, approximately 1 g of dried plant tissue was placed in a 50 ml conical tube. Sterile distilled water, ethanol or methanol were added to the samples to give a final concentration of 100 mg/ml. The samples were incubated in a water bath at 55°C for 1 hour and then stored at -80°C. The incubation at 55°C was used as Māori heated plant extracts during the preparation of some traditional medicines. The resulting crude extracts were sterilized using a 0.22 μm filter prior to anti-microbial analysis. Native New Zealand plants screened for activity against M. smegmatis. ni = no information available. Plant extracts were tested for bacteriostatic activity in a 96 well-plate format assay using M. smegmatis mc 2155/pSHIGH+hsp60 as previously described . Optical Density (OD) and GFP fluorescence were used to detect growth inhibition. M. smegmatis was cultured for 24 hours in Luria Broth (LB) supplemented with D-arabinose (1 mg/ml), Tween 80 (0.1% v/v) and kanamycin (50 μg/ml). Sterile distilled water (150 μL) was added to the outer lanes of the 96-well microtiter plates to minimise evaporation. Liquid media (50 μL) was added to the remaining wells. The effect of the solvents used on the growth of M. smegmatis was tested. Inhibition of M. smegmatis growth was observed at concentrations of ethanol and methanol greater than 5% (v/v). Plant extracts were added to columns 2 and 3 of the microtitre plates with a starting concentration of 2 mg/ml corresponding to a solvent concentration of 2% (v/v). A two-fold serial dilution was then performed on each extract starting at column 3. M. smegmatis cells were added to rows B-D at a final OD at 600 nm (OD 600) of 0.2. Rows E-G contained media and extract alone, to measure any background optical density or fluorescence associated with the extract. A number of controls were added to ensure assay reliability, including the use of standard anti-tubercular drugs, rifampicin and streptomycin, as positive controls, each starting at a concentration of 100 μM. All extracts and controls were tested in triplicate. Plates were sealed and incubated at 37°C with 200 rpm shaking for 96 hours, after which the plates were read for OD and GFP fluorescence. For active extracts, dose response experiments were performed to validate activity versus M. smegmatis. M. bovis BCG and M. tuberculosis H37Ra cultures were grown in Middlebrook 7H9 broth supplemented with 10% (v/v) OADC (0.06% oleic acid, 5% BSA, 2% Dextrose, 0.85% NaCl), glycerol (0.5% v/v) and Tween 80 (0.05% v/v). A bacteriostatic assay was set up as previously described , with cells added to give a final OD 600 of 0.05 . All extracts and controls were tested in triplicate. Plates were sealed and incubated at 37°C with 200 rpm shaking for 14 days before the GFP fluorescence and/or OD of the cultures were measured. GFP-labelled S. aureus Newman was cultured in LB containing erythromycin (30 μg/ml) and xylose (0.5% w/v). GFP-labelled E. coli DH5α/pOT11 was cultured in LB containing chloramphenicol (25 μg/ml). IPTG (100 μg/ml) was added to induce GFP expression. The bacteriostatic assay for S. aureus and E. coli were performed as per the M. smegmatis bacteriostatic assay method except cultures were incubated for 24 hours at 37°C with 200 rpm shaking post addition of extracts. A Perkin Elmer Envision 2102 multilabel plate reader and the Wallace Envision Manager 1.12 software program were used to measure the OD and GFP signals of the microtitre plate cultures. OD was measured at 600 nm. GFP fluorescence was detected using excitation and emission wavelengths of 485 nm and 510 nm, respectively. 12-point scans were performed on each well to minimise intra-well variation. The intrinsic absorbance and fluorescence readings of extracts alone were measured to account for background signal and subtracted from the readings for the test samples. Data were normalised by expressing the absorbance and fluorescence values as a percentage of a no-drug negative control. Dose-response curves were plotted using SigmaPlot (version 10.0) and minimum inhibitory concentration (MIC) and 50% inhibitory concentration (IC 50) values were calculated. 45 plants native to New Zealand (Table 1) were extracted with water, ethanol and methanol and the extracts were tested for their ability to inhibit the growth of the fast-growing species, M. smegmatis. Extracts from 6 plants species, Laurelia novae-zelandiae, Lophomyrtus bullata, Metrosideros excelsa, Myoporum laetum, Pittosporum tenuifolium and Pseudopanax crassifolius showed inhibition towards M. smegmatis (Table 2). Dose-response experiments were performed on the active extracts and their MIC and IC 50 values were determined. The most active extract was derived from L. novae-zelandiae (Pukatea). The bark of L. novae-zelandiae generated an IC 50 value of 0.02 mg/ml, respectively while the cambium had an IC 50 of 0.25 mg/ml (Table 3). Significant activity was also observed with respect to the leaf, IC 50 of 0.11 mg/ml, and flower, IC 50 of 0.41 mg/ml, of M. excelsa. The leaf of P. tenuifolium was less active with an IC 50 value of 0.78 mg/ml (Table 3). Anti-bacterial activity of plant extracts towards M. smegmatis mc2155. '+' indicates ≥ 90% inhibition of M. smegmatis growth at a concentration of 2 mg/ml or lower. MIC and IC50 values of active plant extracts with respect to M. smegmatis and clinically-relevant bacterial species. MIC, minimum inhibitory concentration. IC50, 50% inhibitory concentration. The extracts of L. novae-zelandiae, L. bullata, M. excelsa, M. laetum, P. tenuifolium and P. crassifolius were tested against M. bovis BCG and M. tuberculosis H37Ra. The leaf of P. tenuifolium was the most active extract with respect to M. tuberculosis with an IC 50 of 0.51 mg/ml (Table 3). The bark taken from L. novae-zelandiae had an IC 50 of 0.54 mg/ml against M. bovis and an IC 50 of 2.39 mg/ml against M. tuberculosis (Table 3). The cambium of L. novae-zelandiae was similarly active against both M. bovis and M. tuberculosis. The leaf extract from M. laetum was not active against M. tuberculosis. To examine the specificity of the anti-bacterial activity of the plant extracts, the extracts were also tested against S. aureus and E. coli. The leaf of M. excelsa which was active against M. smegmatis and to a lesser extent, M. tuberculosis, also displayed antibacterial activity towards S. aureus with an IC 50 of 1.17 mg/ml. None of the extracts tested exhibited anti-bacterial activity towards E. coli up to the 10 mg/ml concentration tested. Plants and their extracts have been used by indigenous peoples for the treatment of infectious diseases such as tuberculosis since long before the discovery of antibiotics. A recent study determined that more than 80 plant species have been used by traditional medical practitioners in Uganda to treat tuberculosis . Another study characterised leaf, bark and root material from trees used as traditional anti-tubercular medicines in South Africa. Direct bacteriostatic activity towards Mycobacterium aurum was identified for Acacia nilotica and Combretum kraussii at concentrations ranging from 1.56 to 0.195 mg/ml . A survey of the ethnobotanical literature was used to select plants used by traditional healers in Mexico to test for activity towards M. tuberculosis. Extracts of Citrus aurantifolia, C. sinensis and Olea europaea were found to be active against both drug-susceptible and drug-resistant strains of virulent M. tuberculosis with minimum inhibitory concentrations of between 0.1 and 0.025 mg/ml . Although, the New Zealand shrub Lophomyrtus bullata (Ramarama) has been identified as having activity towards Bacillus subtilis , to current knowledge, Pukatea or other New Zealand plants have not been assayed for activity against mycobacteria . In New Zealand, the bark of Laurelia novae-zelandiae (Pukatea) (Figure 1A) was used by Māori in a number of medicinal remedies but it was especially noted for its use against tubercular lesions [22, 23]. The pulp of the cambium was boiled in water and the resulting liquid used for treating tubercular ulcers. The timber of Pukatea was also used by Māori to create figureheads for canoes . Pukatea is generally found in lowland forests in the North Island and the northern areas of the South Island . It can grow up to 35 metres and produces plank buttresses (Figure 1B) to support the tree's growth in swamp or shallow-soil areas . Pukatea has so-called 'toothed' leaves (Figure 1C) and produces small flowers . Images of Laurelia novae-zelandiae (Pukatea) specimen located at Otari-Wilton Bush, Wellington. A, branchless trunk and canopy of Pukatea. B, plank buttress of Pukatea. C, examples of "toothed" leaves of Pukatea. In this work, we characterised Pukatea and 44 other native plants for activity towards M. smegmatis. Extracts from six New Zealand plants were found to have activity against M. smegmatis. Bark and cambium samples from Pukatea were the most active against M. smegmatis (Table 3). Furthermore, the bark and cambium extracts were also active against M. tuberculosis. The direct anti-mycobacterial activity of the Pukatea extract therefore correlates with the use of this plant by Māori to treat tubercular lesions. This strengthens the possibility that the bark of Pukatea contains previously-unknown anti-tubercular compound(s). In Māori medicine, M. excelsa was used in the treatment of sore throats. Although the traditional use of M. excelsa does not include the treatment of tuberculosis, extracts from M. excelsa were nevertheless active against M. smegmatis and M. tuberculosis. Similarly, the leaf of P. tenuifolium, used by Māori to treat skin infections, was active against M. smegmatis and M. tuberculosis. The anti-mycobacterial activities that were detected for M. excelsa and P. tenuifolium extracts could relate to their traditional use in anti-infective therapy. Of the extracts shown to have anti-mycobacterial activity, only the M. excelsa leaf extract displayed activity against S. aureus. Interestingly, none of the plant species tested exhibited antibacterial activity towards E. coli. It should be noted that the MIC and IC 50 values of the extracts in the different mycobacteria (Table 3) will be subject to variation due to species differences, the type of growth medium used, and the assay incubation time. There is growing interest in identifying the compounds responsible for the anti-mycobacterial activity of traditional medicines and developing them as potential new tuberculosis drugs. Although the chemical basis for the anti-tubercular activity of Pukatea needs to be elucidated, earlier chemical studies identified a novel alkaloid, pukateine, from the bark of Pukatea. Pukateine is an analgesic which acts as a D 2 dopamine receptor agonist and α1 adrenergic receptor antagonist [26, 27]. A number of the other plant extracts found to have activity against mycobacteria have also been analysed chemically. The flower of M. excelsa contains ellagic acid which is a polyphenol antioxidant . Bullatenone, discovered in L. bullata (Ramarama), is an antiseptic . Chemical derivatives of bullatenone have been found to have anti-microbial properties against Bacillus subtilis . Ngaione, a hepatotoxic sesquiterpene, found in the leaves of M. laetum (Ngaio) has been used in the treatment of athletes foot . It is possible that compounds such as pukateine, ellagic acid, bullatenone or ngaione may contribute to the anti-bacterial activity of their plant extracts. These compounds offer a starting point for future studies to characterise the chemical basis of the anti-bacterial activity of L. novae-zelandiae, M. excelsa, L. bullata and M.laetum. They may also assist in identifying ways to improve the efficiency of the extraction of anti-mycobacterial activity from the plant samples and hence, provide extracts with lower MIC values towards M. tuberculosis. Such extracts will be integral to any bioassay-guided purification of active compounds. It is estimated that less than 10% of the Earth's higher plant species have been analysed for any kind of bioactivity . There is a need for more research to be conducted on plants that have been traditionally used by indigenous peoples to treat tuberculosis, for the identification of new anti-tubercular drugs. New Zealand has a diverse flora which potentially offers many unique bioactive compounds. Drawing on knowledge from traditional medicine, we have identified a number of native plants which contain activity against M. tuberculosis. Determining the chemical species responsible for this activity will be the subject of further studies. We gratefully acknowledge the support of the Health Research Council of New Zealand (grant number 07/379), the Wellington Medical Research Foundation (grant no. 2009/184), and the University Research Fund, Victoria University of Wellington (grant no. 26211/1496). MA is supported by a Victoria University of Wellington PhD scholarship. We would like to thank Kathryn J O'Toole for assistance with plant species identification. We would like to thank Karori Wildlife Sanctuary (Zealandia), Otari-Wilton Bush Reserve and Kaitoke Regional Park for enabling collection of plant samples. EAE collected the plant samples, performed the solvent extractions and antibacterial assays with M. smegmatis, E. coli and S. aureus. MA perfomed the antibacterial assays in the slow-growing mycobacteria, M. bovis BCG and M. tuberculosis H37Ra. RVM assisted in testing the potency of the plant extracts. SS constructed the GFP-labelled S. aureus. RO'T conceived and funded the study, and planned and supervised the experimental work. All authors have read and approved the final manuscript.